The nation’s leading GPS experts are struggling to quantify how the world’s premier navigation and timing system affects the U.S. economy, an effort critical to building a political firewall around GPS spectrum in the face of ballooning demand for broadband capacity. The research challenge was highlighted in comments by Jules McNeff, vice-president at Overlook Systems Technologies, in the current issue of Inside GNSS: "In the case of GNSS services, these [benefits] are more difficult to quantify because they are both direct and indirect, include second- and third-order benefits, and are not simply revenue streams from direct subscription services. They are spread across all economic sectors and represent revenues from increased efficiencies in logistics and related economies of operation, improved safety, reductions in personnel costs and exposure to hazards, and others." The PNT advisory board, which agreed to look at economic impacts last year at the request of the National Executive Committee for Space-Based PNT (ExCom), spent part of its December meeting weighing reports from three researchers it had commissioned to find and assess data on GPS benefits and spectrum valuation that others had already gathered. One of the most recent studies discussed was Issue 3 of the GNSS Market Report, a study released by the European GNSS Agency (GSA) a few months ago. GSA found that the annual shipment of GNSS devices worldwide jumped from 125 million in 2006 to roughly 850 million in 2012, said Nam Pham of ADP Analytics. By 2022 that is expected to grow to 2.5 billion units a year, bringing the total number of GNSS devices in circulation to around 7 billion — enough for every person on the planet to have one. 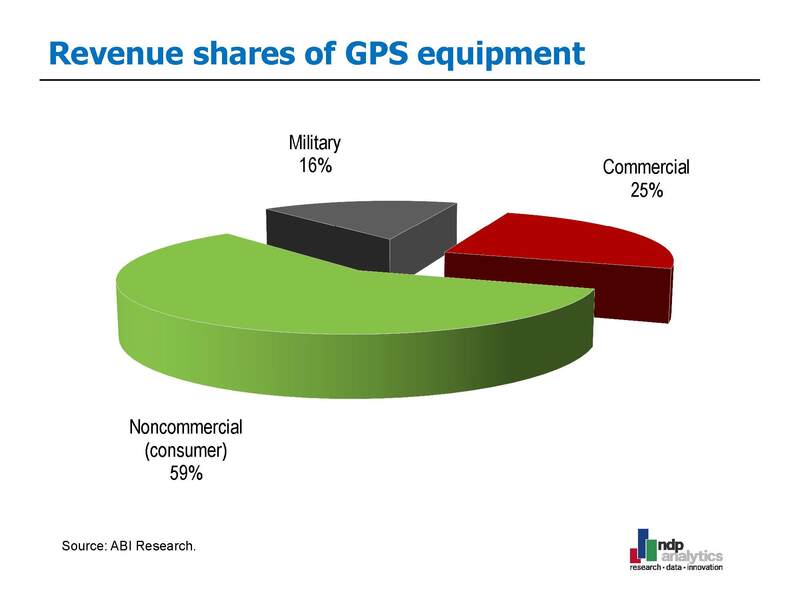 The total global revenue for GNSS devices was forecast to grow to $143.9 billion by 2022 from $59.4 billion in 2012. Of the global activity in 2012, North America generated more than 70 percent of the aviation revenue and nearly 60 percent of that from agriculture. Thirty percent of LBS revenue was from North America, while surveying and road applications came in at around 25 percent each, rail at roughly 15 percent, and maritime applications at around 10 percent. Direct revenue is only one of the economic factors for any given industry, said Pham. Companies buy raw materials and hire workers who in turn use their wages to buy homes and other goods. Pham estimated that GNSS manufacturers contributed $32 billion in output and $6.8 billion in earnings to the U.S. economy, generating more than 105,000 total jobs in the process. He based his figures on the 2011 U.S. Census Bureau Annual Survey of Manufacturers. The European study, however, appeared incomplete to at least one member of the board — an assessment with which Pham agreed. Geringer’s point illustrated the shortcomings in the available data at the heart of a wide-ranging discussion within the board, which was weighing how to approach the question and at what point it should present numbers — even preliminary numbers — to the ExCom. Even so, the European study appears to be one of the best available in that it is recent — it was released in October of this year — and broad in scope. Cleland presented the result of a literature review on the market research. Among those new applications, he said, are GPS-enabled clothing, including shoes that help you find your destination, and GPS-based sports analytics that teams can use to assess and improve their play against a specific opponent. Moore’s law that computing power doubles and costs are halved every 18 months is “roughly applicable” to the GPS industry, Cleland said, and is a realistic guide for how often you need to do new studies on an industry. “About every 18 months you have to reshuffle the deck,” he said. The need for better data on PNT’s economic impact was made clear during the fight over LightSquared’s proposal to repurpose spectrum near the band used by GPS, thereby creating what tests eventually showed would be debilitating interference to GPS receivers. The economic data presented by the wireless broadband industry at the time seemed to give the telecom companies the upper hand in the policy debate, said Geringer. Many studies support the argument that broadband needs more spectrum, said Cleland. The number of studies is partly due to the industry being well organized. Interest in the subject is global, he said, and some broadband companies have the cash to support economic-benefit research for their industry. For example, he said, a report from the International Telecommunications Union and the United Nation’s Educational, Scientific and Cultural Organization details the global economic effects of broadband with GDP numbers, penetration to growth rates, and analysis of ancillary benefits such as eradication of poverty or increased educational opportunities. Related reports are also available as well from the Telecommunications Industry Association and even individual companies such as CISCO. That fight is only going to become more intense as companies scramble to capture consumers who want “everything, everywhere,” said John Kneuer, a former National Telecommunications and Information Administration chief and a spectrum policy expert. Wireless carriers are trying to provide content inside the home, cable companies like Comcast and DISH are devising ways to deliver content outside of the home, and applications providers like Google and Amazon are maneuvering to become content conduits. The broadband industry is converging on a ‘singularity” where all the companies are competing with each other to control the same customers — and it all rides on the availability of spectrum, said Kneuer. Although Cleland said that he didn’t see why “GPS doesn’t sit right alongside a lot of these technology issues in importance,” he said it was unlikely that the pressure on GPS spectrum will ease.